Amended plans for the new Black Rock Congregational Church. 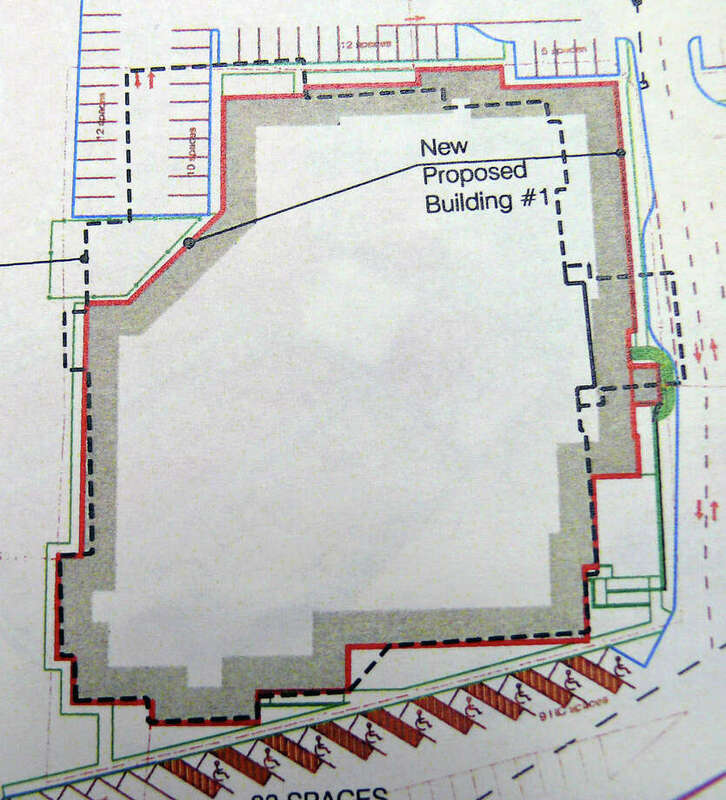 The dotted black line is the building originally approved by the Town Plan and Zoning Commission, while the red line shows the new, downsized church. The sluggish economy is forcing Black Rock Congregational Church -- at the center of a 2005-06 zoning battle to build what neighbors denounced as a "mega-church" -- to downsize plans for the smaller complex the congregation finally won approval to build last year. The Black Rock Turnpike church, through its lawyer William Fitzpatrick, on May 1 submitted a request to the Town Plan and Zoning Commission for approval of newly revised plans. The revisions were approved unanimously Tuesday night by the TPZ without requiring a new application, since commission members decided the changes are consistent with the plans approved by the commission in 2011. "Economic conditions have significantly affected the church and its members, resulting in the decision of the church to downsize the new church," Fitzpatrick said. The revamped plans reduce the size of the new church complex from 79,950 square feet to 71,411 square feet. It would still be located in the essentially the same place on the property at 3685 Black Rock Turnpike, although part of the existing church complex will be incorporated into the project. "When we determined that we would need to build to a smaller budget, we looked at the ways we could lower our costs of the building," said Ken Brix, executive director for the church. "We found that we could renovate existing space for about half the cost of new, so we made the decision to renovate about 40 percent of the existing church building." There will be no changes to the building's proposed height or steeple and the new sanctuary's seating will remain the same, Fitzpatrick said. Black Rock Congregational's existing church is 33,010 square feet and seats 550 worshippers, and the new one is expected to seat about 950 worshippers. There also will be no changes to the storm-water drainage plan, the use of porous pavement, on-site traffic circulation or the Black Rock Turnpike entrance. "The one significant change is a reduction in the square footage of the new church building," Fitzpatrick said. The new church complex will be built in two phases. The first phase will be one-story and encompass 53,000 square feet with an estimated cost of $16 million and construction beginning in October, according to Brix. The next phase would add a 14,000-square-foot second floor.